A seemingly harmless hotel advert featuring a man and woman enjoying breakfast in bed in bathroom robes has come under heavy backlash on social media. The ad features a young couple in their bathrobes enjoying a selection of pastries and a fruit platter while holding reading material. It is this choice of reading material that some have labelled sexist – with the man perusing a copy of the Australian Financial Review and the woman clutching a Chanel coffee table book. Users on Twitter were quick to point out the stereotypical aspects of the photograph, slamming the suggestion women only read insubstantial material about fashion. 'Yes, newsflash for @SofitelBrisbane — some women are in fact more interested in whether stocks and shares are going up and down than whether hemlines are,' one woman wrote on Twitter. 'Of course the fruit platter is on her side, she'd be loathed to touch the baked goods...' wrote another user taking exception to the choice of breakfast items. 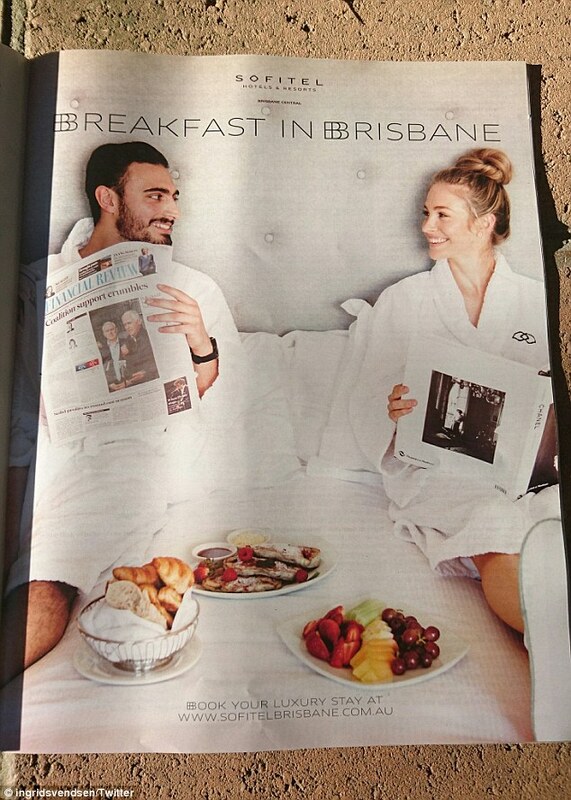 The advert appeared in Fairfax's Good Weekend magazine for the hotel chain Sofitel in Brisbane. 'There was no intention of portraying a stereotype but we recognise it and apologise for any offence that it has caused,' a spokesman for the hotel chain said.